Moxibustion means to stimulate acupuncture points by heat. The heat is created by burning of herbs. The herbs may or may not directly contact the skin. If the burning herbs do not touch the skin, it is called indirect moxibustion (Fig. 1a and 1b). If it touches the skin or touch the skin through a piece of something, such as ginger or garlic, or salt powder or something else, which is located between the herbs and the skin (Fig. 2a and 2b), it is called indirect moxibustion. Fig. 1a. Indirect moxibustion on leg. Fig. 1b. Indirect moxibustion on knee. Fig. 2a. Moxibustion herbs are put on fresh ginger piece that touches the skin (on stomach). Fig. 2b. Moxibustion herbs are put on fresh ginger piece that touches the skin (on stomach). The function of moxibustion is still, as for the mechanism of acupuncture, unknown. It seems that the heat is not the only explanation of the moxibustion in the healing, since what we know is that the healing effect would be replaced by burning of a cigarette. Also, the healing effects of a moxibustion is largely affected by the quality of the herb (its brands and the geographic area of growth). Moxibustion needs only several minutes to several ten minutes each time but needs to be repeated tens of times usually. Moxibustion is good for the treatment of many clinic conditions that belongs to weakness and cold conditions, according to TCM diagnosis. For example, it is good for arthritis, paralysis, post stroke syndrome, menopause syndrome and muscle weakness. It is also very useful to save life if one is very weak in the heart beat, and with poor circulation. It should be emphasized that the function of the moxibustion can not be completely replaced by acupuncture or herbal therapy. In practice, the combination of these three healing methods is quite common in daily clinic work. 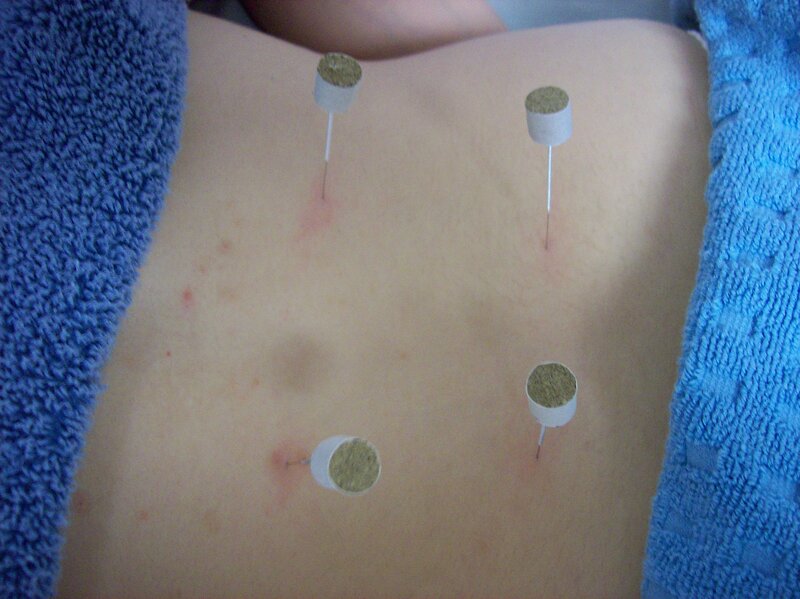 In current Chinese Medicine, doctors may also apply the moxibustion herbs at the end of the acupuncture needles. It is called acupuncture-moxibustion (Fig. 3a and 3b). It increases clinic healing effect in many cases. Fig. 3a. Moxibustion column is put on the top of acupuncture needles. Fig. 3b. Burning of the moxibustion herbs. The use of moxibustion might be limited in most acupuncture clinics for the fact that they have no good ventilation facility in the clinic rooms. Though there is so called no-smoke moxibustion in the market, we found that it does not at all work as good as traditional moxibustion herbs. Scientific research also further indicated that, the healing effect of traditional moxibustion can not be replaced at all by use of different burnings, such as cigarette or burning of other herbs. In our clinic, moxibustion is also used mostly to change body constitutions of clients who suffered from frequent allergic reactions year by year. It is definitely also useful in people who fear acupuncture needles.